McGREGOR FLY landing nets come in two sizes which cover a very broad range of fishing situations. Made of the highest quality materials, they combine good looks with functionality. 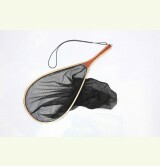 The folding net is suitable for both fresh and saltwater conditions. 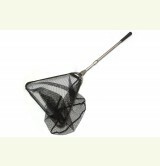 The Deluxe folding net has a head measuring 45cm x 45cm, and a handle extending from 75cm to 1.5m. The Classic wooden hand net totals 63cm in length, with a head measuring 42cm x 27cm. Powerful magnet holds your net safely. With extension cord to enable net to be accessed from front or back.